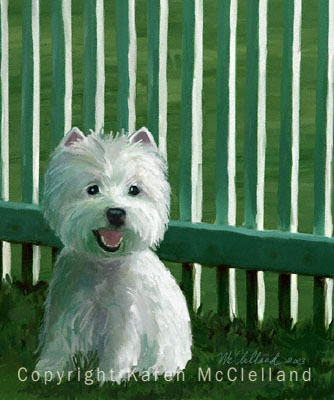 West Highland White Terrier -- Westie limited edition art print, dog painting done by artist Karen McClelland titled "Highland Green"
West Highland White Terrier (Westie) dog print titled "Highland Green"
I love the smiling faces that this breed has. Obviously I also love playing with color, and the Westies white coat is a perfect foil for doing so. Image size 12" x 10"